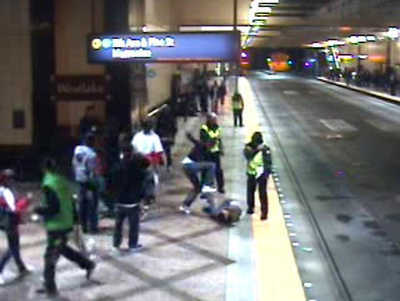 Television news this week showed video of a girl in Seattle being brutally kicked and beaten by other girls while three security guards stood by and made calls on their cell phones—apparently calling for help. No move to help the victim. The outrage was compounded by unnamed officials who defended the guards’ (non-) conduct as proper. Jack Marshall in his ethicsalarms.com blog has an excellent analysis of the guards’ behavior, likening it to the Nuremberg defense (“just following orders”). The Los Angeles County Board of Supervisors got it right in 2007 when they ordered closure of the Martin Luther King Jr.-Harbor Hospital. The hospital had been the venue for a series of egregious mistreatments of patients, but when a woman was left writhing on the floor of the emergency room for 45 minutes before dying of a perforated bowel, that was the last straw. Behaving without humanity, even under orders, ought to be a firing offense. The guards should have been fired. So should the “officials” who defended their conduct. Just like the bystanders and their higher-ups at MLK-Harbor Hospital were. This entry was posted on February 14, 2010 at 3:40 am and is filed under Ethics-general. You can follow any responses to this entry through the RSS 2.0 feed. You can leave a response, or trackback from your own site.